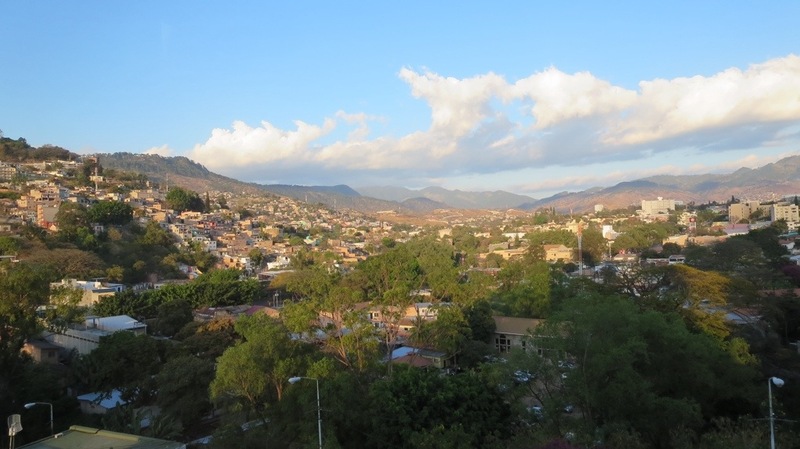 03/01/14: I am sitting here on my bed in a corner room at the Hotel Honduras Maya watching the sun set over Tegucigalpa. I love this city. It’s somewhat difficult to explain: it’s kind of dirty, it’s gritty, and it is definitely not one of the safest cities in the world right now. But when I step off that plane, I am hit by this fragrance (not entirely sure what it is, but it’s smoky and floral) that is welcoming and calming. Maybe this is just what 80- degree March weather smells like and I’m just completely unaccustomed to it. As I type here, watching the buildings and surrounding hills turn yellow, then orange,then pink in the fading light, I feel completely relaxed. I can hear the loud music and see people swaying a few blocks away at what appears to be an evangelical church service. Amidst the trees I can see a Texaco and a Western Union and a Circle K (prompting the inevitable Bill and Ted quote, “Things are amiss at the Circle K, dude”). And if I get off the bed and look to the left, I can see the statue of Jesus that looks down upon the city from the hill. After months of planning and moving and stressing, it feels really nice to be able to just sit in quiet and write right now. Mind you, I’m not supposed to be here right now. I should actually be in a town called Nacaome staying at a hotel with the rest of my volunteer group from CapeCARES (pronounced “CAH-pay CAR-ays” locally. I love it!). However, the powers that be at United Airlines have foiled that plan. My early flight from Cleveland this morning was delayed after the pilot informed us that our plane had mistakenly been loaded with “4000 extra pounds of fuel.” I actually laughed out loud because I thought he was joking. How does that happen??? So we were a bit late arriving in Houston, but I wasn’t too worried. Half of my plane companions had tight international connections, so I assumed that most of these flights would be held for a few more minutes. Still, I sprinted through two concourses and arrived completely out of breath, only to hear the gate attendant apologize, “I’m sorry : your flight has left.” Whaaaaaaat?. I was dumbfounded. (Actually, I made a loud exclamation that I will not reprint here). I have never missed a flight. Never, even though I’ve had to sprint and be the last person on a connecting flight more often than not due to delays. 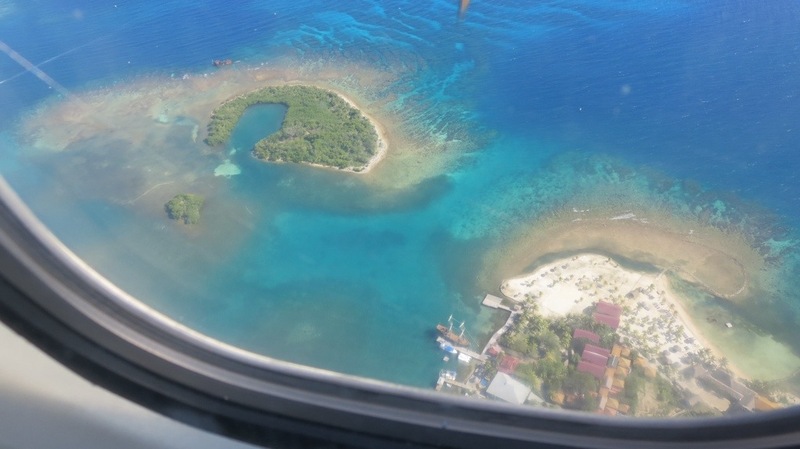 A far more helpful person at the United customer service desk was able to route me on an immediate flight to Roatan (yay!) 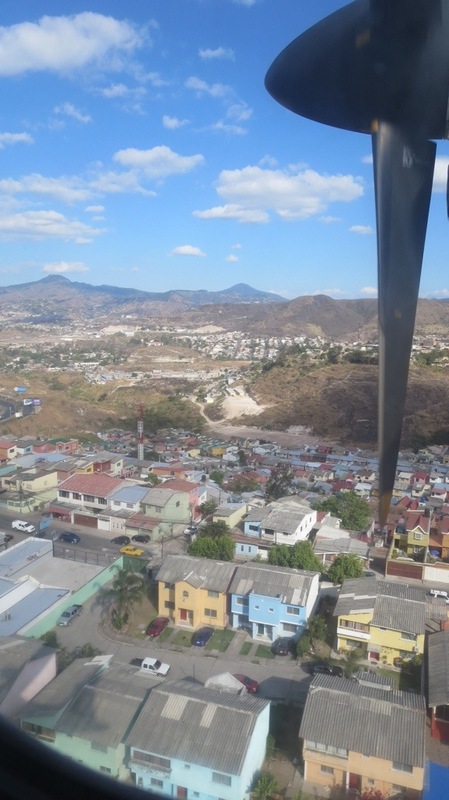 with a connection on Avianca Airlines to Tegucigalpa. I’d arrive almost four hours late, but at least I’d get there the same day. In Roatan, my luggage didn’t arrive, which I expected, so I went to wait for a United rep to confirm the bag had been sent to Tegus. After waiting over half an hour in line at the check-in desk (there was no customer service office that I could see in the small airport) and getting nowhere, I found out by word of mouth from other waiting passengers where I could go to ask for help. They motioned to an opening between the last two check-in counters. So I waited. 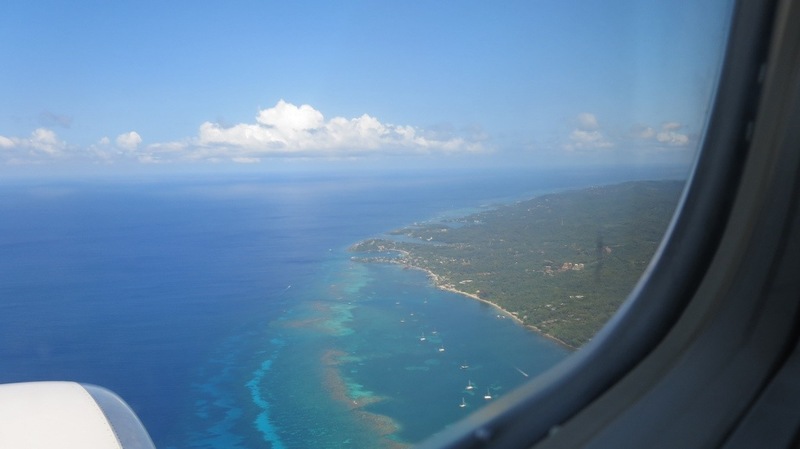 Then they said, “No, you have to go through.” For future reference, if you ever lose luggage at the Roatan airport, simply climb over the right- most luggage scale at the check-in counters and proceed through an unmarked door to your right. There you will easily find the United Lost Luggage office. Sigh. My bag made it to Tegus. I made it to Tegus. My bag was nowhere to be found in the baggage area in Tegus, and all United offices and desks were kindly closed by 4pm. Thanks, United! Thank God that Norma, our local liaison who helps with logistics of each CapeCARES trip, was there. She brought me to the Maya and will pick me up tomorrow morning to take me to the airport, help me to claim my luggage, and then drive me to San Marcos. Unfortunately, the suitcase I carried on has none of my personal belongings (it’s full of donated children’s clothes for an orphanage that I will miss visiting tomorrow; don’t think that those will fit me!). I do have some toiletries in my daypack, so I’m all good until tomorrow. In the meantime, I am just taking this as an opportunity to have some quiet time and to sleep! Very thankful that I have such a nice place to stay. Could be a LOT worse. I am glad you are having fun and keep safe! Najlepse hvala, Tanja! (I had this whole response in Slovenian before, but apparently it didn’t post. Also realizing that I can’t type either Slovenian or Spanish characters on this keyboard). Lep pozdrav to everyone at Droubi Bros.
Looks beautiful! Missing you at the Oscar party! Oh man, the adventures have already started! Glad you made it safely! Hello, Tooth! Glad to hear you’re finally loose on the world! 🙂 Live it up! Super contenta de que a pesar de todo te este llendo bien. Disfrutado. Gracias, Oscani. Ya estoy aprendiendo mucho espanol en mi viaje. Hola a Ricardo y Esther tambien! we are all sitting here looking at your blog and missing u badly!!!!! Missing you all, too, and great to hear from you. My right thumb is still partly numb from all the extractions last week. I could never be an oral surgeon full-time ;). Tell everyone hi for me, and ask Nancy if she would like to accompany me as an interpreter until I get this language thing down! AJ is totally jealous your experience! Be happy u r not here as we went thru numerous upgrades on software which means nothing works and poor Sheede started in the midst of my computer burnout/meltdown! Miss your smiling face! Good to hear from you! Trying to decide which is worse: sitting here to a nice breakfast of Cipro, Powerade, and Club Social crackers, or dealing with massive software meltdowns. I have concluded that despite my current intestinal distress, at least right now I have a nice view of a lake and the weather is warm. 😉 I hope the computer issues are resolved soon. Say hi to everyone and good luck to Serena! Thanks! Hoping to post some nice photos that the little guys might enjoy, too :).